To reach the Mission, travel south on Interstate 5 and take Interstate 8 east. Take the Mission Gorge Road exit and turn left. Travel down to Twain Road and turn left. The Mission lies about a half mile down the road. Mission San Diego de Alcalá, established by Padre Junipero Serra on July 16, 1769, is the first of the 21 California Missions. 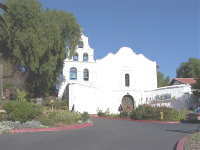 It is considered to be the first church ever erected in Alta California (what is known as present day California). 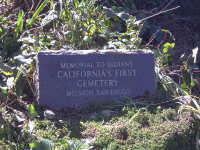 It also contains the oldest known cemetery in present day California. The cemetery is located in the Mission Courtyard, and contains the remains of hundreds of indians who had been converted to the Catholic faith. Names of the indians were not recorded. Padre Luis Jayme, died November 5, 1775 at the age of 35 as a result of casualties suffered in an indian attack. Padre Juan Figuèr, who arrived at the Mission on November 1772, and died December 1784. 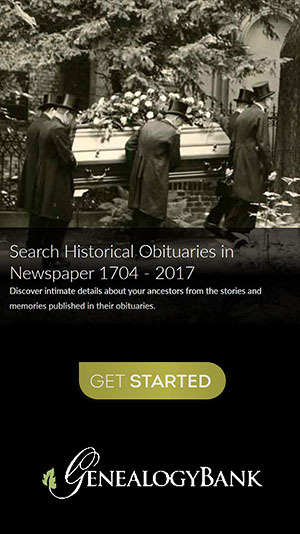 Padre Juan Mariner, who arrived at the Mission on December 1785, and died January 29, 1800. Padre José Pinto, who arrived in San Diego on July 28, 1810, and died June 30, 1812 as a result of poisoning by an indian cook. Padre Fernando Martín, who began service at the Mission on July 6, 1812, and died October 19, 1838. Source: "San Diego de Alcalá - California's First Mission", by I. Brent Eagen.